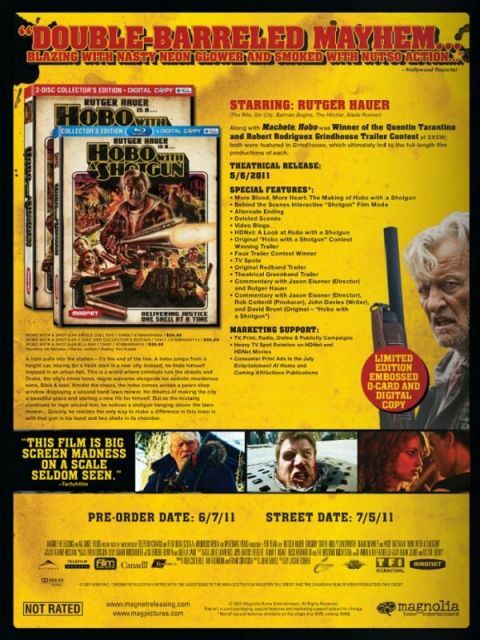 “Hobo With A Shotgun” Bluray Announced!!! I really enjoyed this movie. It was a hell of a lot of fun. Read my REVIEW HERE. In an early announcement to retailers, Magnolia Pictures will release this one-of-a-kind film on bluray on July 5th of this year. I can’t wait for this release. The SRP for the release is $29.98, but Amazon has it up for pre-order right now for $20.99. Along with the bluray there will be a 2-disc DVD version. BRYAN’S MUST OWN BLURAY/DVD’S FOR THE 1ST WEEK OF AUGUST!!! BRYAN’S MUST OWN BLURAY/DVD’S FOR THE FIRST WEEK OF JULY!!! This entry was posted on Monday, May 2nd, 2011 at 1:08 pm	and is filed under Film, News. You can follow any responses to this entry through the RSS 2.0 feed. You can skip to the end and leave a response. Pinging is currently not allowed. I can’t wait for this!!! Where are the links? How do I get the DVD version? Pre-Orders are not up yet. POssible in May or June they will be up for pre-order. « Geek Deal of the Day Doesn’t Give A Damn!!! Gone With The Wind Bluray Ultimate Gift Set $27.99!! !